Greening growth will require a significant reconfiguration of current and future investment, with further incremental costs beyond a business-as-usual approach that need to be financed. Given the current financial crisis, public resources are limited, however, and the reliance on public-sector investment in the longer term must be reduced to ensure sustainable green growth. This places private finance at the core of the transition. Unlocking private finance can be challenging: certain green technologies have real or perceived higher risks for a potential investor when compared with conventional investments that have a track record of consistent returns. Unfamiliarity with technologies also plays a role, particularly in developing and emerging markets where green growth needs are particularly high. Green technologies often have higher capital costs, especially during the earlier stages of development, which can further deter investors. An emerging body of experience suggests considerable potential exists for closing the green investment gap by mobilizing private finance through the targeted deployment of public finance. It is crucial to reform policies and incentives to give the right signals to investors, providing a strong enabling framework for investing.s In parallel, private sector investment can be achieved by using a range of proven instruments and mechanisms to help reduce the cost of capital and investment risks. While public-private finance mobilization and leverage ratios are difficult to calculate or compare across projects, countries and instruments, ratios of 1:5t and above are not uncommon, and there are some cases of instruments, such as grants, delivering ratios of 1:8 and higher. 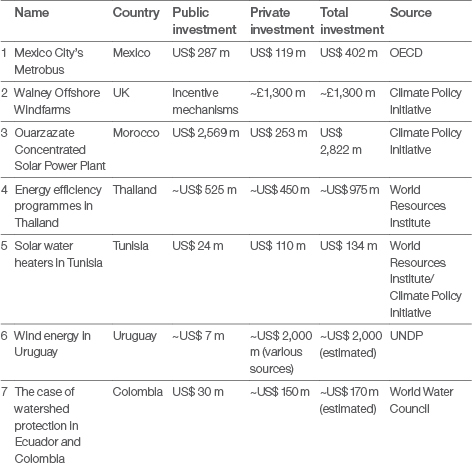 To close the cost gap to support green growth through targeted public action, public investment would need to increase by 21–46% to US$ 116–139 billion but could act to double current private-sector investment to US$ 558–581 billion (Figure 12). This assumes that public finance has the potential to mobilize four to five times its contribution from private sources and that all of the public finance is leveraged at this average rate. Note: The debt-to-equity ratio in Figure 12 is assumed at 70:30 based on the current average debt to equity ratio of clean energy asset finance projects according to Bloomberg New Energy Finance. The analysis of initiatives and case studies (Table 2) highlights successful examples of finance mobilization throughout this chapter. Full details of case studies are given in Appendix 2. Note that some investment sources given in the table may be estimated based on the designed financial structure and do not necessarily indicate achieved performance. s For a recent review of these issues see: Corfee-Morlot, J. et al. Toward a Green Investment Policy Framework: The Case of Low-Carbon, Climate-Resilient Infrastructure, Environment Directorate Working Papers, No. 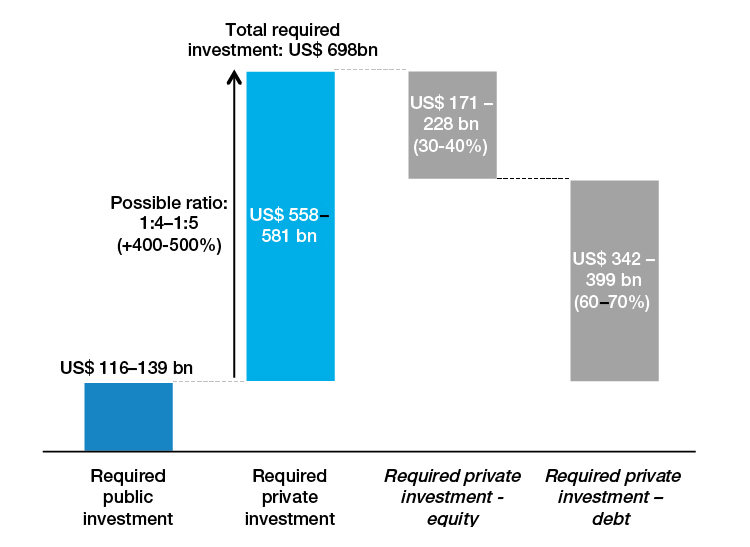 48, Paris: OECD Publishing, 2012.
t Indicating that US$ 1 of public funding mobilizes a further US$ 5 of private investment.